Final to cheer on St Maurs ladies in their quest for back to back Leinster titles. 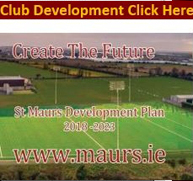 St Maurs led 0-2 to 0-1 after 2 early scores from Olivia Leonard Before 2 well worked goals by the opposition put Dunboyne in the driving seat in the first half. Points from Olivia, Naomi Clare twice , Niamh and Laura Carthy kept us in touch at the break 0-7 to 2-5. The second half started well for the Rush team with Niamh Carthy again pointing and Maurs attacking well but a long clearance and a looping shot by the Dunboyne corner forward put them 0-8 to 3-6 in front. Maurs then had our best period of the game scoring 1-2 without reply to leave just 2 in it with 15 mins to go. 1-11 to 3-7, laura Carthy who was excellent throughout got our goal. 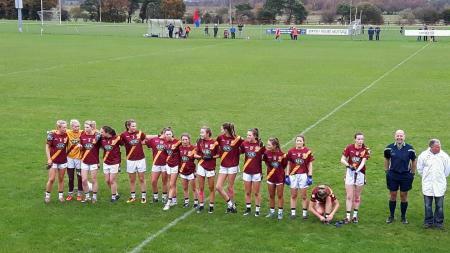 However Dunboyne , All Ireland junior champs in 2015 finished stronger with 5 unanswered points to run out winners by 7. 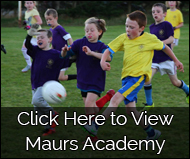 The Maurs girls had chances to close the gap but credit to our opponents they defended very well and kicked the ball accurately from defence to relieve the pressure on several occasions. Our ladies team deserve huge credit for their achievements not just this year but over a number of seasons. How about this for a roll of honour with several ladies on every team. The club now has almost 300 juvenile girls playing football All looking to emulate their heroes. With panels of 30-40 at every age from U8 to U13. This legacy is probably the greatest achievement of all. So take a bow ladies and thank you from all the club.